Although I didn’t lose any weight this week, my waist feels smaller and my arms are definitely toner. I am excited to measure myself again at the end of week 8 just to see the inches lost at the end of phase 2. 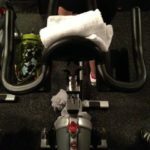 What better way to start off the week than with an awesome sweat session at Cycle Studio and Body Revolution workout 7? I love breaking a good sweat first thing Monday morning and it was awesome doing my workouts back to back. It sets the tone for the week ahead and helps me to clear my mind. Unlike last week, I want to remain focused and relaxed this week. Although I have plenty on the to-do list, I want to enjoy each day. It can be easy to let your week spiral out of control, causing you to lose focus of your goals and your mission. Take each day as it comes, focus on your daily goals, and enjoy how you feel after accomplishing your goals. Continue packing for our move! I find it somewhat odd, but I am just LOVING oatmeal now that it’s summer and couldn’t get enough smoothies when it was the winter. I’m an odd duck, what can I tell you? This morning is a great example of my breakfasts these days. Oatmeal with almonds and fresh strawberries. So tasty and filling. For lunch I had a salad with tuna and some light balsamic dressing. I’ve been trying to eat my salads with protein for lunch and then fruit and/or 99% fat free popcorn for a snack. Today I bought some awesome fruit salad, kiwis and strawberries. Dinners are all over the place, per usual but Neal and I have been eating more grilled chicken and veggies or various homemade paninis. This week I want to try out a new recipe and start testing out some new things before Neal and I move in together. It really looks to be a wonderful week and I look forward to sharing it with y’all along the way. Please let me know if there’s anything in particular that you’d like me to blog about. I’m also open to ideas or questions.